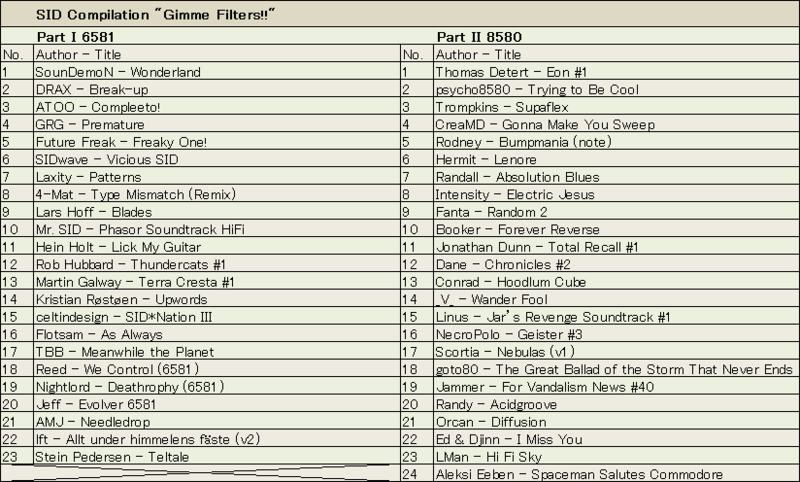 The filter is regarded as one of the strong suits of SID, the sound chip built in Commodore 64. Although the designer Robert “Bob” Yannes thought “it was the worst part,”  actually, the feature has made the sound chip unique and something worthy of being worked with by many composers for years. In short, the filter is a critical point in composing music with SID, coloring your tunes drastically in various ways. This compilation series is designed to include tracks which present a variety of uses of the filter. SID is broadly divided into two models, or 6581 and 8580 – ‘older’ and ‘newer’, and the two sound very differently each other in terms of especially the filter, therefore the compilation series is inevitably divided into two parts. Andreas Varga (1996): Interview with Bob Yannes: https://web.archive.org/web/20070211132821/http://stud1.tuwien.ac.at/~e9426444/yannes.html. Among programmable sound generators developed in the 1980s, SID has a big feature that there are at least two different chips under the same name. As it had been fixed in the manufacture process and several revisions had been produced. And generally, the sound chip can be identified by two generations, 6581 and 8580 (by the way, each four digits refer to its product number). A tune made with one chip is not necessarily played back on the other precisely. On the contrary, sometimes it even sounds very differently. As you say, all C64s sounded different, but I worked out early on that the main reason for this was the onboard filters rather than the SID itself. If I remember correctly, the filters were very simple resisters or capacitors bolted onto the board and because of a lack of quality control at Commodore they worked differently for each C64 – at least that’s the story I was told. That’s why I rarely used them in fact . Differences between individual sound chips depend on setting of standards of how they are made. This issue is not limited to SID; for example, it was found in the manufacture of Philips SAA-1099. In the technical documentation supplied by Philips, no values are given for the resistor and capacitor that form the output filter. The lack of consistency in the production of these components results in a similar inconsistency in their actual values, the net result of this being a wide variety of timbral outputs . Of course, such instability of the physical bases of sound output has annoyed many composers and programmers, as well as fascinated. Follin tried to ensure ‘compatibility’ of the effect of the filter by limiting its use on purpose. It is a technique in handling the touchy filter. The technical disadvantages of the SID must be the filter (but…). The creator of the SID [Robert Yannes] chip didn’t finish the filter, cos of Commodore’s deadline. The machine had to get released. That’s why some C64s cut off filter sound differently. 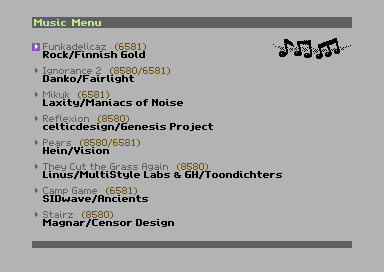 But on the other hand, thanks for the bugs, or digi music would never be heard on a C64. So actually it’s an advantage as well. [..] I think the SID has been explored to its limits . In 1981, Charles Winterble and Robert Yannes at MOS Technology created a list of features that they wanted when beginning the design of SID, but they eventually stopped at the result that “about two-thirds or even three-quarters of the list” was finished. Therefore, some features which Yannes desired ended in illusion such as a multiplex oscillator . And for example, the common ADSR bug was left as ‘given’ . It is not uncommon that some musicians define specific revisions of SID (especially 6581) to use . Of course, those ‘preference’ has often to an extent conditioned by models of Commodore 64 or 128 they have used, however, it has linked more to composers’ touches of works through their subjective decisions: Scortia (Thomas Bendt) and DRAX (Thomas Mogensen), two Danish SID musicians who started to be active from the late 1980s. The former chose 8580 at that time, while the latter has consistently explored composition with 6581 up to today. The question of 6581 or 8580, which you choose is not necessarily exclusive. Some tries to optimize their tunes for two ‘versions’, 6581 and 8580, e.g. PVCF, Hein Holt, Reed, celticdesign, etc. However, it should be noted that the composers who use both models in parallel are rare among the whole SID musicians. This choice of possibility does not still fade away after the appearance of GoatTracker (2002), the first cross-platform tool for composing with emulated SID sound running on modern OS. But in many cases, new SID musicians who started to be active after 2000 tend to choose 8580, which is more ‘stable’ than 6581. 6581 and 8580 are the ‘same’ chip called SID, whereas many sonic effects which are impossible to achieve to the other have been explored over time. They were often achieved by investigating particular bugs and specifications. The interactivity peculiar to composition made with SID is amazing. Surely you can see that the two compilations include glimpses of it. Sebastian Tomczak: On the development of an interface framework in chipmusic: theoretical context, case studies and creative outcomes, Adelaide: The University of Adelaide, 2011, p. 92. Available at https://digital.library.adelaide.edu.au/dspace/handle/2440/70888. Jazzcat (1997): Interview with Geir Tjelta: http://www.atlantis-prophecy.org/recollection/?load=interviews&id_interview=54. Brian Bagnall: Commodore: A Company on the Edge (2nd Ed. ), Winnipeg Manitoba: Variant Press, 2010, pp. 372-374. Sid ADSR problem / hardrestart | CSDb User Forums: http://csdb.dk/forums/?roomid=14&topicid=27340. Which 6581 revision… | CSDb User Forums: http://csdb.dk/forums/?roomid=14&topicid=24994. Linus – Jar’s Revenge Soundtrack #1 , 2011 Tristar & Red Sector Inc.